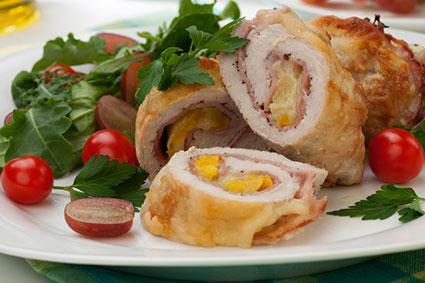 Chicken roulade is a remarkably versatile dish that tastes great and looks beautiful. 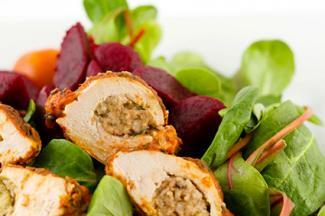 Essentially, roulade is chicken meat that has been pounded to be thinner and is rolled around a filling. 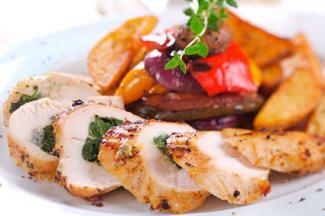 With that basic beginning, you can make an array of chicken roulade recipes. Making chicken roulade takes a few different steps. Once you understand the basics, however, you can repeat the recipe with a variety of flavor variations. You can make chicken roulade from either a chicken breast or a chicken thigh, depending on your personal preference. Thighs will make smaller rolls. Choose boneless, skinless thighs or breasts, or remove the bone and skin yourself, if you have the skill to do so, while leaving the breast or thigh all in one piece. Place the boneless, skinless breast on a cutting board with the smooth side down. 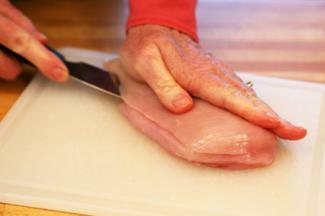 If you are butterflying a breast, cut away the chicken tender, which is a small fillet on the inside of the breast. Save the tender for another use. Turn the breast back over so the smooth side is up. Place your hand on top of the piece of chicken to hold it in place. Insert the blade of the knife along the edge of the breast lengthwise. Carefully cut inward until you almost reach the other edge of the breast. Do not cut all the way through the edge. Using the uncut edge as a fold, unfold the piece of chicken so it has essentially doubled in surface area. To butterfly a chicken thigh, follow steps three through six above. Put the butterflied chicken on a cutting board that you have covered with plastic wrap. Put another piece of plastic wrap over the top of the chicken. Using the smooth side of a meat mallet, gently pound the chicken so it is even thickness. The typical seasoning is salt and pepper, but you can add an herb or spice blend if you wish, as well. To season the chicken, sprinkle salt and pepper generously over both sides of the chicken. Lay the chicken on a cutting board. Put the stuffing in the center of the chicken so it has a log shape running along the length of the piece of chicken. Fold the ends of the chicken up and around the stuffing so it makes a roll. Tie twine around the roll at 1/2 to one-inch intervals to secure the roll. Spread the chicken evenly with the stuffing, covering the surface of the chicken except for a small margin around the edges. 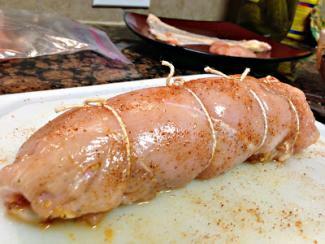 Starting at one edge working along the length of the chicken, roll it a few times around the stuffing. Secure the roulade at even intervals with either toothpicks or tied twine. In a large saute pan, heat two tablespoons of olive oil over medium-high heat until it shimmers. Add the chicken and cook, browning on all sides, three to four minutes per side. Don't overcrowd the pan because that prevents browning. Depending on how many pieces of chicken you are making, you may need to work in batches. Put the roulades in a roasting pan and transfer them to the oven. Bake until the chicken is cooked through, about six or seven more minutes. The internal temperature of the chicken should be 160 degrees Fahrenheit. Rest the chicken for five to ten minutes. Put the pan directly on a burner on medium-high heat. Add 1/2 to one cup of a liquid such as white wine, port, chicken broth, champagne vinegar, or citrus juice (or a combination thereof) to the pan and use the side of a spoon to scrape any browned bits from the bottom of the pan. Add a teaspoon of chopped fresh herbs or 1/2 teaspoon of dried herbs, such as thyme, tarragon, rosemary, garlic, or a blend thereof. Simmer until the liquid reduces by half, six to eight minutes. Swirl in 1/4 cup of very cold butter, cut into small pieces, one piece at a time. Plate the roulade by cutting it into slices and fanning it on a plate. Spoon the sauce over the top. One of the great things about chicken roulade is just how versatile it truly is. You can use all kinds of flavor profiles to make the stuffing. Try one of two very different versions. This recipe will fill four chicken breasts. In a large skillet over medium-high heat, cook the bacon, stirring occasionally, until it is crispy and the fat is rendered, about five minutes. Remove the bacon from the skillet with a slotted spoon and set it aside. Add the onion to the bacon fat and cook, stirring occasionally, until it softens, about four minutes. Add the apples and cook, stirring occasionally, until the apples soften, five minutes more. Add the garlic cloves and cook, stirring constantly, until it is fragrant, about 30 seconds. Add the chicken stock and use your spoon to scrape any browned bits from the bottom of the pan. Allow the mixture to cool slightly. In a large bowl, combine the apple mixture, the reserved bacon, the breadcrumbs, egg, sage, salt, and pepper. Mix to combine, adding more chicken stock as needed to moisten the stuffing. Proceed to filling the chicken with stuffing, rolling, and cooking the roulade as described above. This spicy roulade stuffing adds a lot of flavor to your chicken. It makes enough stuffing for four chicken breasts. In a large sauté pan over medium-high heat, heat the olive oil until it shimmers. Add the chorizo and cook, crumbling with a spoon, until it is browned, about five minutes. Add the onion and cook, stirring occasionally, until it is soft, about five minutes more. Add the baby spinach and lemon juice and cook, stirring constantly, until it wilts, one to two minutes more. Remove from the heat and allow it to cool slightly. In a large bowl, combine the breadcrumbs, cheese, egg, and cooled chorizo mixture. Mix until well combined and proceed to make the roulade as outlined above. Making a chicken roulade is relatively easy once you have the technique down. When you combine it with a delicious side dish such as loaded mashed potatoes, as well as a vegetable, such as string beans, you have a delicious meal to serve to your family.